Member Success: Mom’s the Word! Priscilla is a mom of two boys ages 1.5 and 3.5 years old. Needless to say, she stays very busy. Before having her second boy, she decided to leave her nursing position at Mayo Clinic to stay home full time. 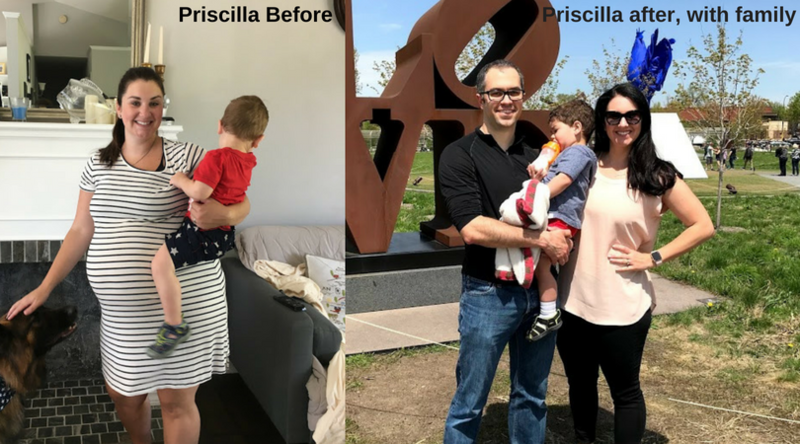 With these significant life changes with pregnancies and taking on more responsibilities, Priscilla gained extra weight. Six months after having her second baby, she started exercising more frequently, eating better and, yet, her weight barely shifted. Priscills recounts, "I felt defeated. None of my non-maternity clothes fit, and I didn’t feel like myself at such a heavy weight. After much thought and consideration, I committed myself to a strict diet and daily activity (weight lifting and cardio). My goal was to lose 50 pounds in 2017." With her husband's demanding schedule as an orthopedic surgery resident, it was difficult to find the time, energy and patience for herself, but she quickly realized she needed it in order to be the best mother and wife that she could be. Consequently, Priscilla started to see the weight come off and her old clothes fitting again, which was a huge motivator for her to keep up her routine. "Fortunately, the DAHLC had just lowered their childcare prices and I was financially able to workout more now," Priscilla says. "So, I took full advantage, I come to the DAHLC 5-6 days a week now. My boys love coming too, they have made so many friends at the daycare, and the women there are the best! They have really made it easy to incorporate this routine into our lives. Also, the hydro-massages that are available at the DAHLC are a great way to incorporate relaxation into a stressful and busy life. I also just completed my first small group coaching session with Tiffany, and I would highly recommend it to anyone who wants to change up their workouts or wants to get acquainted with the gym." Priscilla gives some wise advice to those that want to make changes as well. "If you want to see change you have to stay positive, and commit yourself fully." She advises to start small, and set clear, defined goals. "Failure will happen, so be kind to yourself, and begin again, and again. I was most inspired by meeting my fitness goals and seeing all the positive changes my body was going through. I was becoming stronger, faster, and had much more endurance to keep up with my growing boys. I even inspired my husband to begin a regular workout routine, and he also enjoyed the healthy food I supplied in the house. Resilience took me far in this weight loss and fitness journey. I am happy to say in 2017 I surpassed my weight loss goal!" To Priscilla, the future appears more fulfilling than it did previously. She feels more confident and capable as a mother and wife, and that is priceless. She concludes with, "Overall, the changes that the DAHLC has allowed me to make in my life have been overwhelmingly positive, and I feel as though I am an improved person throughout because of it. So thank you DAHLC and Mayo Clinic." Thank YOU, Priscilla, for making your health and well-being a priority and showing us how to do so as well!